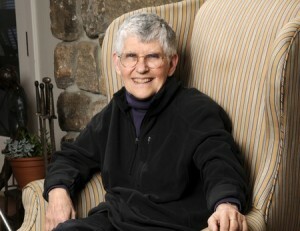 Cynthia Enloe, via Connecticut College. Curiosity, arguably, is the antidote to the passivity in politics. When we question the assumptions of candidates’ platforms, especially with regard to women, and when we learn from movements that take women seriously, we stand to awaken something more active and empowered within ourselves. In Cynthia Enloe’s words, “This makes us smarter”; feminist knowledge is a potent form of power. Professor Enloe is one of the most beloved scholars of feminist political theory in the United States, and has published more than a dozen books — most recently, Nimo’s War, Emma’s War: Making Feminist Sense of the Iraq War. She is particularly interested in the how militarism manipulates the lives of women in an effort to foster support for the agenda of war. Her voice is thus timely in the midst of so many political battles in the United States surrounding women’s freedoms. Her work is influential and gripping because it challenges us to cultivate curiosity. In that spirit, I recently had the chance to ask her some questions of my own. Whenever I write or talk publicly about feminism, I hear people insist that “it’s not just about women.” How do you define feminism? I think that feminism is about women, but it’s also about women’s relationships: to each other, to the workplace, to men — in families and in the workplace — to governments, and so forth. I think that the core of what feminism is keeps evolving, and no one has this down pat. They shouldn’t! It’s such a dynamic idea, and it grows historically, across cultures. I think that no one should try to have a cookie-cutter answer. But, at this point in my thinking, feminism is the pursuit of deep, deep justice for women in ways that change the behaviors of both women and men, and really change our notions of what justice looks like. When did you begin thinking about feminism and its relationship to nonviolence and action for social justice? I remember the first time I began to really pay attention and think more, and be curious actively about women, feminism, men and nonviolence — all those things together. It was during the Greenham Common Women’s Peace Camp, in the 1980’s in England. The camp was started by a group of women from Wales who sat around their kitchen table and said, “Why is the British government working hand in hand with the American government to base nuclear missiles here?” Greenham Common was a small town in southern England and a U.S. military base. They literally got up from their kitchen tables in Wales and started a walk. It started out as a mixed walk of men and women, though the core group was women. They camped at the base and became one of the most famous peace camps in the last century. Even now, if you say “Greenham Common” in England, people will start singing a song, or tell you they were there (or their friends or mothers or daughters were there), so the Greenham Common Peace Camp became really important in the international peace movement, and particularly in the women’s peace movement. When all these women camped there overnight, in the mud of the English drizzle, they had these endless conversations about peace activism and feminism. More and more women came from all over the country, and some came from other countries, too. One of the camp’s most famous actions was climbing a fence, at night, into this highly guarded military base and they got up on one of the mounds for the missile silos and danced in the moonlight. Then, they actually got out again, without getting arrested — which was amazing — and began to think about the kind of activism they were doing. The first thing they decided was only to do actions that people who were partially-abled can do. It was very interesting because it got them talking about nonviolence, about disablement and able-ment privilege, about peace and activism, and about feminism. They put all those things together night after night around their campfires and began to come to some conclusions. This isn’t where they started, but it’s where they came after a peace encampment of three years. They came to their ideas about nonviolence through their thinking about which kinds of actions can do two things: capture the spirit of what peace looks like, and what would be the most inclusive. This was really an eye-opener to me, so when I think about nonviolence and feminism, I think about the women in the Greenham Common Peace Camp, in the English drizzle. But I also think that there was something classically feminist in what emerged. One of the things they had to think about was that, if you have a peace camp, who’s doing the laundry, who’s doing the childcare if there are any children, who’s doing the unheroic stuff? If you are going to have a peace action, it can’t be patriarchal. It can’t have the men doing the physical, classically “heroic” stuff on camera and have the women serving the coffee, doing the laundry or taking care of the kids. All of a sudden you find yourself talking about patriarchy inside a peace movement, and how to avoid it. Actually, when feminists in New York hosted their Feminist General Assembly, the Men Against Patriarchy working group did the childcare. Yes! And when they do it, that should be no big deal. See, that’s the next thing. You know it’s just like in households when men who are nice guys do the childcare so that the women can sit around the table and have a nice chat, and the guys are praised for the next three weeks for putting the kids to bed or doing the dishes. Everyone’s saying, “Wasn’t Charlie great?” But nobody ever said that Charlotte was great because she did what was normal to do. So the whole thing is for the guys to start doing some of the feminized work, and make no big deal of it and women make no big deal of it. Photographers really are addicted to that image of women with only their eyes showing, both men and women photographers. They seem not to be able to resist it. I can’t abide it. It’s about women as unattainable, women as mysterious, women as remote, as well as woman under total control. I was looking just the other day at a website that I respect and they used a photograph of women lining up to vote in Egypt. The point was to make clear the variety of women that were going to vote in Cairo. You could tell the photographer couldn’t resist a line of women that included a woman in full hijab. If you look at hundreds, I mean it, hundreds of images of people going to the polls in Cairo to vote in the spring, you would have a hard time finding many women in full hijab; that’s not very common in Egypt. Many women wear headscarves, but not the full veil. But those at this organization that I otherwise really like, they loved this photograph. They showed other women, but they loved having one woman fully veiled going to the polls. While it’s great that this woman was voting — that’s terrific — my concern is about what the photographer thought they were up to, and what we as the onlookers supposedly get excited about. Amnesty International and other good organizations need to be careful about how they exoticize all kinds of women. When it comes to Filipino women, they sexualize them; when it comes to Middle Eastern women, they exoticize them using these facial images. That is turning women into commodities, even if it’s for a human rights cause. What about the message on the poster? Do you agree that NATO is the cause of any progress in Afghanistan? I think any progress that’s been achieved for women in Afghanistan has been due to the guts and bravery and intelligence of Afghan women themselves. Afghan women have worked so hard as mothers of daughters, as lawyers, as human rights activists, as people running for the legislature. So many Afghan women have resisted masculinized, violent forces to carve out some space for women’s dignity, women’s literacy, women’s schooling, and women’s political and public influence. It’s a huge accomplishment that they have carved out as much space as they have, but it is very fragile and very wobbly. Again, you have to listen to varieties of Afghan women. They debate with each other about whether the NATO forces should leave. It’s not easy to be a feminist in a war zone; you are oftentimes deeply ambivalent about forces any other time you’d be opposed to. But we barely hear their debates. There are only a few journalists who listen carefully to Afghan women in their debates with one another. It’s a cruel position they are in, and none of their choices are great. They don’t control any of the major parties, they don’t control any of the ministries under Karzai, they certainly don’t control NATO, they certainly don’t control the Taliban insurgents, they certainly don’t control any of the warlord militias that are aligned with Karzai. Karzai’s own government is very wobbly because of internal corruption within his regime, but also because he has made himself dependent on male warlords and their militias. Say you’re a human rights lawyer, or maybe you’re just someone wanting to get a paid job in a beauty parlor, or you’re trying to keep your daughters in school, and then think of how many groups who could prevent you from doing just that one thing. I think that one of the things we need to do as the U.S. and NATO pull out is increase our efforts to find out what Afghan women are saying and what they are saying they need from us. The withdraw of NATO should mean increasing engagement by us in our curiosity to find out what Afghan women are saying. It’s going to be hard, though. What does security look like in a feminist paradigm? How can we be careful not to imitate old paradigm security in our work for social transformation? First of all, security from a feminist perspective doesn’t reproduce men as the protectors of women and women as the victims of physical violence and appreciative of men’s protection — that is the model of the U.S. military and the model of every military that I’ve ever studied. One really has to think of the privileges that come from being the protector because, oftentimes, it means that you have more access to the outside world — whatever the outside world is. It could be the media; it could be the site of the activism or the police around where the activism is taking place. Real security comes from women protecting men when they need it, and men and women both learning the skills it takes to be an effective guarantor of security. Sometimes being a guarantor of security means that you can talk well — not in that you have good grammar, but that you know how to use speech to lower tensions. A lot of women have those skills, which makes them very good security people because they can deescalate those tensions. They also know how to be observant. If you know how to be observant, and how to use speech and body language without violence to get people to be more conscious of what their roles should be, you make a very good security person. What else can we do to build feminist consciousness around new forms of security? We always have to learn lessons from the recent past. Talk to people who have been active in the kinds of groups you are in who are a bit older and ask what men and women did when they were in those groups — how men thought about masculinity and how women thought about femininity. I think we should not have to reinvent the wheel, and we should try to find out about what kinds of distortions went on in earlier groups that we don’t have to repeat, if we will look at them straight on. Do you have any advice for how we begin to engage in those needed conversations about our activism? People need to be very candid with each other. For example, have an honest discussion about heroism: When you think of heroes, who comes to mind? See how much physical bravery is part and parcel of heroism, and what courage and bravery look like, because that’s where physical actions sometimes get privileged, and where certain kinds of “being a man” get privileged. It’s something personal, but not intrusive, and also interesting. If this kind of sharing feels risky in a group, you know you’re on to something. Terrific interview with a wonderful woman, a living treasure, really. Thank you so much for doing it, Stephanie!